POS Hardware: our adaptive, highly efficient POS models have a small footprint and offer customizable configurations. Kiosk POS: the perfect combination of sleek and functional -- our kiosk POS solutions feature our robust POS hardware and software and are currently being tested by 7-Eleven® and other retailers. Omni-Channel: platform offers real-time direct fulfillment solution that enables retailers the ability to offer a mobile POS solution on the store floor. NEC Cloud Platform for Retail: hybrid cloud-based architecture enables real-time data sharing between stores as well as Omni-channel solutions. Store Lifecycle Management Solution: ensures non-stop operation and helps retailers expand their business through preventative maintenance and store development management functions. Interactive Projection System **: uses projection technology to create interactive applications that offer unique customer experiences. Image Recognition Service**: the GAZIRU (smartphone image recognition service) which uses photos or media taken with smartphones to provide detailed information on products and services. Object Recognition POS**: analyzes products visually enabling quick and accurate scanning of multiple products without cashier interaction. Facial Payment**: a media-less payment service using facial recognition to provide shoppers with a speedy and secure payment option. Facial Recognition Avatar: uses NEC’s NeoFace® face recognition technology to recognize known individuals or profiles, “Kylie” greets visitors, provides them with information pertinent to the store such as the arrival of new items or in-store sales. NeoFace® Watch: integrates existing video systems or cameras to enhance security by capturing and matching images against a watch list of individuals. 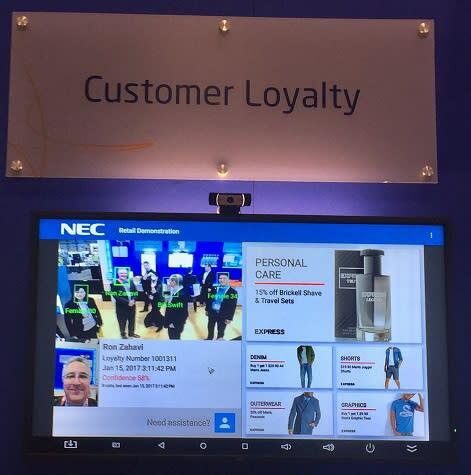 Biometric Customer Loyalty Solution: created in collaboration with Brierley+Partners, this solution provides seamless loyalty and CRM capabilities using NEC’s leading facial recognition technology backed by Brierley’s robust CRM platform hosted on Microsoft Azure Cloud. Shelf Detection**: suitable for scenarios like, loss prevention and shelf replenishment, it uses video surveillance to notify store personnel when item(s) have been removed from the shelf in the exact location in the store. Heat Mapping: combines the use of heat mapping to track customer product engagement and dwell times at specific products and locations in the store. Video Analytics: captures shopper demographic information, such as age and gender with data analytics software. Infrastructure as Service (IaaS): Hosted at Iron Mountain’s 220 feet underground data center, NEC’s IaaS for SAP HANA® solution helps funnel customer data and business intelligence in a highly secure and federally compliant environment – all with a financially manageable and predictable operational expense. 4K Solutions: deliver cutting-edge technology from NEC Display Solutions with stunning visual performance including displays ranging from 55”-98” to supply retailers with the right product for a wide range of applications. Video Wall Solutions: NEC Display delivers multiple sized canvases for your digital needs and range from 46”-55” – these panels deliver best-in-class picture quality, image stability, and design to lead the charge in large scale display solutions. Interactive Display Solutions: range from 32”-84” to deliver the right technology for kiosks, interactive digital signage, interactive store fronts, and customer experiences. Large Format Displays: Commercial-grade large format displays from NEC Display range from 32”-98” and deliver quality performance and full features that deliver the right solution for indoor or outdoor retail applications. ** Reference exhibit sample only. www.necam.com/smartretail. Follow us on our Blog, YouTube, LinkedIn, Facebook and on Twitter @NEC.' data-reactid="39" data-type="text" type="text">To learn more about NEC's retail solutions, go to www.necam.com/smartretail. Follow us on our Blog, YouTube, LinkedIn, Facebook and on Twitter @NEC.